Vertebrate development requires the formation of multiple cell types from a single genetic blueprint, an extraordinary feat that is guided by the dynamic and finely tuned reprogramming of gene expression. The sophisticated orchestration of gene expression programs is driven primarily by changes in the patterns of covalent chromatin modifications. These epigenetic changes are directed by cis elements, positioned across the genome, which provide docking sites for transcription factors and associated chromatin modifiers. Epigenetic changes impact all aspects of gene regulation, governing association with the machinery that drives transcription, replication, repair and recombination, a regulatory relationship that is dramatically illustrated in developing lymphocytes. The program of somatic rearrangements that assemble antigen receptor genes in precursor B and T cells has proven to be a fertile system for elucidating relationships between the genetic and epigenetic components of gene regulation. 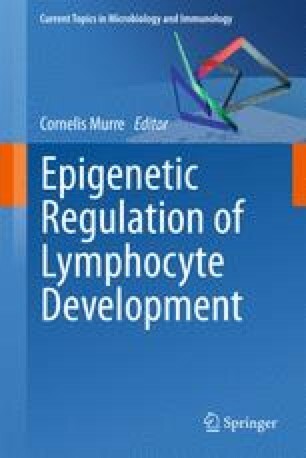 This chapter describes our current understanding of the cross-talk between key genetic elements and epigenetic programs during recombination of the Tcrb locus in developing T cells, how each contributes to the regulation of chromatin accessibility at individual DNA targets for recombination, and potential mechanisms that coordinate their actions. ML Sikes is supported by grants from the National Institute of Allergy and Infectious Diseases (R56AI070848-01A1) and GSK. EM Oltz is supported by grants from NIAID (AI07973208, AI0822402, AI08251702, AI7494502), NCI (CA15669001), and NIEHS (ES019779).